Lupa is a pagan author, artist, eco-psychologist and amateur naturalist living in Portland, OR. She has spent her life being utterly captivated by the natural world around her, a fascination that led her to earth-based spiritual paths. 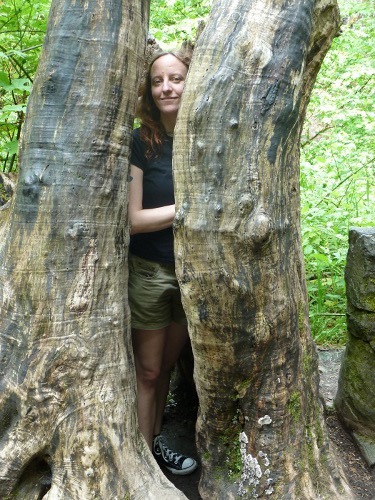 She is the author of several books on nature spirituality, including “New Paths to Animal Totems: Three Alternative Approaches to Creating Your Own Totemism” (Llewellyn, 2012) and “Plant and Fungus Totems: Connecting With Spirits of Field, Forest and Garden” (Llewellyn 2014). Paganicon 5 will be Friday, March 13, – Sunday, March 15, 2015 and registration is still available at the door. I interviewed Lupa by phone recently. Nels: Is this the first time you’ve come to the Midwest ? Lupa: I am very excited to attend! I grew up in the Midwest, but this is only my second time visiting Minneapolis. Lupa: I grew up in rural Missouri. Then I lived for two years in Pittsburgh, Pennsylvania which some people consider the Eastern edges of the Midwest. What is bio-regional totemism, the subject of one of your workshops? Lupa: A bio-region is a particular area of land that has the same basic types of animals, plants, and fungi. The same geology and the same climate. For example I live in the watershed of the Willamette River and for the most part the living beings that you find here, the types of geological formation are similar throughout the area. This is one particular bio-region I spend time in. Bio-regional totemism is a way to connect with the land that you live on. Similar to the totems of the beings that also live there. Using the bio-region as a way defining that space of land. Will an animal present as a different kind of a totem in a different bio-region? Lupa: No, not in my experience. I have worked with animals indifferent bio-regions, for example a red tailed hawk I’ve worked with both in the Midwest and out here in the Pacific Northwest. It is still a red tailed hawk in both locations. The setting that we meet in during my meditation is a little different. It is still the same being, it just may have different things to say about a particular piece of land as I’m living on it. Are you using your own personal gnosis and meditation in your spirit work, or where does this information come from? Lupa: I am self taught as far are my knowledge and work goes. I am a white girl from the Midwest. While I have known a few folks who practice indigenous paths I am not a part of those cultures and also not part of the cultures of my ancestors, Czech and German and so forth. I grew up primarily here in the US and that is the cultural background that I came from. I grew up in a Catholic household and didn’t have an animistic tradition to are draw on already, I had to create one from scratch based on my own experiences and trading notes with other practitioners . A seeker in religions is a person trying to see what they believe so they ‘seek’ out information on the different religions and eventually find what they are looking for. For those imbedded in Pagan community one might wonder who is looking? We often forget there is a steady stream of people, young and old, who are looking for a meaningful expression of their spiritual beliefs outside of main stream religions. Sometimes seekers are looking for help clarifying what they really do believe. Seeker classes serve an important function; giving people new to Pagan experience an overview of what the Pagan world looks like and encompasses. Fall is the season many of these classes start. Some classes may only be sponsored every few years by some groups and locations. In an online world of many classes and opportunities there is still really no substitute for meeting in person with fellows on a similar level of investigation, with someone qualified to help guide you, and exploring the many paths of magic and Paganism. If you are a seeker, to find class opportunities you need to get on mail lists, talk to book stores, and get recommendations from those you trust. When you find one, jump on it! If you know a tradition or path you are already interested in use the same resources and ask around. Many groups or covens have ongoing ways for new people to learn about them without an ongoing commitment. Learn the basics of Wicca from ethics and basic protection work to spellwork and ritual creation. We will cover energy work, use of herbs and stones, and more in this once a month class series. To finish out the course, participants will write and perform a final ritual. Everyone will also leave with resources to either continue a solitary path or find the coven that is right for them. Class is provided by Wellspring Coven from Minneapolis. 3rd Thursday of each month, starting October 16th, 2014. $65 Cost covers entire year – 13 month commitment required. in November at Magus Books. They will begin the first Friday in November and are offered free at 6.30pm. Contact Magus Books or the Standing Stones to reserve a spot in the class. Since September the Wiccan Church of Minnesota ( WiCoM )has been doing a series of six seekers’ classes. We meet every second and fourth Wednesday evening at a St. Paul restaurant that has a meeting room to rent. The purpose of the class is to give students just a taste of what Wicca is about and some very basic information about other Pagan paths. We also touch upon the history of Wicca, our church in particular, ethics, ritual, and energy work. At the end of our classes it is hoped that students will know if Wicca is something they wish to pursue. If it is, the class teachers and other church leaders help the students connect with appropriate teachers. Unlike other seekers’ classes that encompass year-and-a-day training, WiCoM Seekers’ classes are intended to give students a familiarity with Wicca and then a connection to year-and-a-day training. It is too late to join this round of WiCoM seekers classes. We hope to have another round in the spring. Folks can watch our Facebook page and website for an announcement about upcoming classes. Event Details: Silver Phoenix is offering seeker classes starting in Feb 2014 and ending in Jan 2015. Our classes typically run for a year, and we have in person classes once a month as well as weekly projects and discussions online. New this year Song has built an interactive student website for the students to complement the classes. Seeker classes are open to anyone interested in learning, and we do not require our students to become members either before or following the end of classes (though we do occasionally offer membership) . Our goal is to help our students find the place that is right for them, be it with us, another group, or as a solitary. If you have information about new seeker class opportunities, please add them as a comment! Gifts, they are on most of our minds this time of year. We anguish over giving them and receiving them, who needs one, who might give us one, why we give them. It is residue from that dominant holiday in our culture, at least the anguish is. Most of the gifts we really appreciate are the ones given from the heart, and specific to ourselves and the receiver. There is a strong alternative movement against all the commercialism. Give some cookies, or a hand-made necklace, a poem, hand-made card, or a special artifact of nature. Give something really personal, these things often have more meaning. Thank you. Our thank you conversations are the flip side of gifts. We always say thank you, but we can’t help but betray what we feel most often. The enlightened honor that old saying, “It’s the thought that counts.” and really endeavor to feel it. It doesn’t matter if we already have two, or don’t need want or like it. It may even feel like an obligation or burden. Why did we not think of them and have a gift? Whatever we feel, as we accept it, we also know most times the giver instinctively senses our reaction, and it falls into a couple of categories. We loved it and appreciate it, we are ambivalent and it is a little awkward, or they sense our subtle dread at the responsibility of accepting it. However it takes place, we complete the gift-thank you ritual and keep moving, it is that busy time of year. I couldn’t find a place which listed the area Pagan events in one calendar, so I asked Robin and he said I could use the calendar from this group to keep track of events. So if you want to keep up on local Pagan events, check this group’s calendar. I’m on a bunch of local groups and I continually add things as I find them. Oh, and I also updated the links section. But I’m not calling dibs. I hope that other people also feel free to add things. Tuesday, Dec 6th, OccupyMpls sponsored Empowerment Training Day at Walker Church in S. Mpls. It was a day to focus on skill sharing. training, and discussion around the core issues facing OccupyMpls. It was designed to build a respectful and empowering culture within the movement. I participated for a few hours in both the morning and the afternoon. The event had a full schedule from 8am – 5pm. I arrived about 10am to a room of about 60 people. Starhawk was going over the principals of meeting facilitation and consensus process. Many present had some experience with these subjects before, and so the depth of the discussion during the presentation was directed at the particular problems facilitating a ‘general assembly’ presented to occupy organizers. About 10.25 am the meeting was interrupted by an announcement the Plaza security had ‘raided’ the camp earlier that morning as about 8.30am and had taken all unattended items from the Plaza. Several county commissioners phone numbers, who were reported to be meeting Tuesday, distributed and calls were made in rotation as the workshop training continued. The importance of incorporating core values into the consensus, and general assembly processes was emphasized, as well as the need to select the best decision-making process for each issue the group faced. Consensus Process is not needed for many movement decisions, just the major ones where core values are being defined. Each group kept notes on its discussion with the aim of discovering insights, and gleaning items for later general assembly proposal and consideration. Every fifteen minutes or so, the groups paused and people rotated among them as they felt called. I participated in the visioning, direct action, and diversity groups. 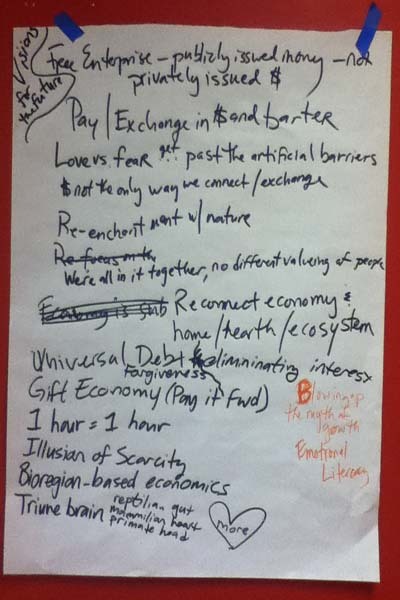 At the end of the session, spokespersons from each group summarized the discussion and outlined items that deserved further work to integrate the ideas within OccupyMPLS. A contact person and email was established for each work group and a sign-up for messaging within each group was posted.